Postcards from the Attic: My first Bubbly Funk class - how exciting!!! I am absolutely delighted to have been invited to teach classes at Bubbly Funk in the newly opened store in Worcester town centre. My first class is going to be a maze book (if you've never made one of these you must come along, they are dinky and cute and so addictive!). My design is pictured above but there will be scope in the class to give it your own twist if you wish. 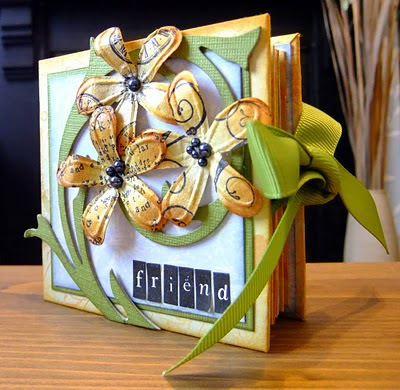 There will be two options to give the class a wide appeal - you can either make a little gift book filled with quotes or you can make a mini scrapbook album using photos. There are more details on the Bubbly Funk website and tickets are on sale now. The class is on Sat 26th February - I am so looking forward to it! I've also got two more classes lined up - one with a Mother's Day theme (think lovely handmade flowers) on 26th March and then an all day Distress Inks Masterclass packed with techniques on 9th April. Watch the Bubbly Funk website for more details. Woohoo for you! The little book looks fab. Yeah, I agree with Annette - let's see inside!